Rivet heating prior to head forming and hot heading is a popular application in the turbine manufacturing industry. A British manufacturer of turbines for maritime vehicles wanted to switch to induction heating and requested Ambrell for the application test on steel rivets. The customer wanted to achieve maximum production efficiency with heat cycles of 10 seconds per rivet, with the end temperature of 700 ºC (1292 ºF). Ambrell’s application engineers tested the application in the Cheltenham laboratory, and recommended a 4.2 kW EASYHEAT system for the customer. Due to the small size of the generator and a remote work head, EASYHEAT was the ideal candidate for inline production. 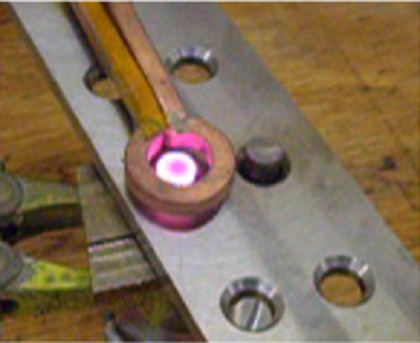 Applying induction heating allowed the Britsh customer to enjoy the following benefits: repeatable and fixed heat cycles, precise heating (only the head of the rivet was brought to temperature) and increased production efficiency. Additionally, induction heating is flameless, which tremendously improved workplace safety at the same time. Ambrell offers remarkable induction heating expertise based on over 30 years industry experience. We offer numerous insights into fastener heating here. We also encourage you to fill out a lab service request form so that we can test your application and recommend an optimal induction heating solution. We offer a remarkable video library - maybe you will see a process like yours tested by our induction heating experts in THE LAB!